I got to see Bela Fleck perform live a year or so ago, it was at an outdoor jazz festival in the Boston area (I think it may have been in Lowell). Some of you may be thinking, "Why would I want to go see something about a guy playing the banjo?" Believe me when I tell you that he is amazing. Especially when Victor Wooten is there with him playing the bass. Bela Fleck will give a brief performance after the film. He will also be introducing the movie and taking questions after the screening. The Coolidge Corner Theatre in Brookline, Mass. will present a preview screening of Throw Down Your Heart, a recent documentary featuring internationally acclaimed banjo virtuoso Béla Fleck, on Thursday, July 9 at 7:00 p.m. The film, directed by Fleck’s brother Sascha Paladino, follows Fleck on his journey to Africa to explore the roots of the banjo and to record an album. Fleck, who has won multiple Grammy Awards, will be in attendance to introduce the film and to perform and answer questions after the screening. Throw Down Your Heart has earned tremendous advance critical praise and has won several awards, including the audience awards at both the Vancouver and the South by Southwest film festivals. 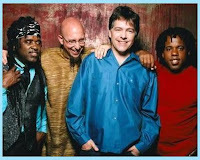 0 Response to "Bela Fleck @ Coolidge Corner Theatre - 7/9"